Avoid peak Summer season if you don't like crowds - Autumn & Spring offer stunning views of the Black Forest. Avoid visiting on a Sunday if you want to do shopping as the boutiques will be closed. 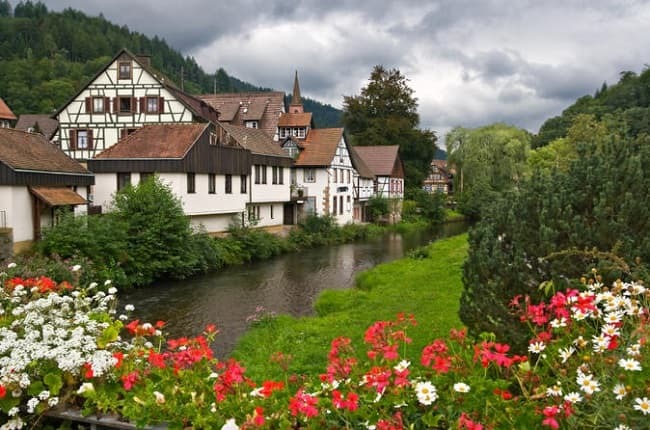 We are comparing Black Forest and Strasbourg Day Trip from Frankfurt Prices from leading ticket suppliers and Try to find you Cheap tickets prices on the market. Baden-Baden is a world-famous historic spa town that oozes elegance with grand buildings and chic boutiques located along its tree-lined avenues. It is located in Southwest Germany on the edge of the Black Forest (Schwarzwald in German) in the state of Baden-Wurttemberg. The Black Forest is so called because of its deep green colour, it's here that you'll find the beautifully picturesque Lake Mummelsee. Traveling West and crossing the French-German border you will enter Strasbourg. A unique bustling cosmopolitan city with picturesque canals, it retains a historic old town (La Petite France) with notable German and French influences. It is a UNESCO world heritage site with an impressive gothic cathedral and is also home to the European parliament. If you have a bad case of wanderlust but only a short amount of time, this is the ideal way to sightsee two countries in 1 day, boasting to people that you visited France as well as Germany! The trip is ideal for couples as well as friends/family traveling together but it's a bit of a long day for younger kids. There is a lot of time on the road so make sure you're a good traveler and don't suffer from motion sickness. Your Experience With Black Forest and Strasbourg Day Trip from Frankfurt? Board your coach at the meeting point in central Frankfurt, where you'll also meet your guide, and travel to the famous spa town of Baden-Baden located in the Black Forest. Enjoy a guided tour around the chic spa town that's known the world over for its thermal baths as you take in the beautiful tree-lined avenues, grand buildings and luxury boutiques. Providing it's open you'll also be able to see inside the Kurhaus Casino before jumping back on the coach to make your way through the dramatic landscape of the Black Forest woods to visit the beautifully picturesque Lake Mummelsee. You will then re-board the coach and cross the German-French border to reach the city of Strasbourg in Alsace, France. Your guide will give a short introduction of the city and you'll take a canal boat ride before being 'let loose' to explore the city on your own - Choose if you want to visit the Gothic Cathedral, do some shopping or explore the backstreets of the historic town center which is actually a UNESCO world heritage site, better known as La Petite France. After sufficient time you'll meet back at the coach and make your way back to Frankfurt after a long but thoroughly enjoyable day sightseeing in two different countries! What Black Forest and Strasbourg Day Trip from Frankfurt Includes? A full day trip taking in sights in both Germany and France! Return travel from Frankfurt by luxury coach or minibus, depending on the number of people booked on the tour. A fluent multilingual guide (German and English) to accompany you on the trip and take you sightseeing in Baden-Baden with a walking tour and a shorter introductory tour at Strasbourg. Admission fee for a canal boat ride Strasbourg. In Strasbourg, if you're given the choice, go on the little road train instead of the canal boat as you'll see more. Travelers Reviews about Black Forest and Strasbourg Day Trip from Frankfurt? Travellers talking about this trip on Tripadvisor and Viator are generally very happy with the tour and recommend it to other travellers describing it as ''A fun way to see Germany and France during a quick trip.'' and "A long day but worth it." People agree that the guide is great, giving lots of interesting information that isn't found in the guidebook and keeping travelers engaged throughout the tour without reciting boring historical facts! Most people agree that they would have liked more time in Strasbourg but say this was a great introduction to the city. When travelling off-season visitors report small group numbers which meant that a more personal experience could be enjoyed. Pack snacks, drinks, and comfy shoes. Check the weather forecast for both Baden-Baden and Strasbourg to make sure you wear the right clothes for the weather conditions. Meet at a central Frankfurt location / ETS Greenline Tours Office - Exact location listed on your confirmation email.